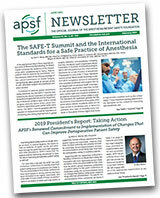 Welcome to the APSF Patient Safety Resources. Rapid Response (formerly Dear SIRS) – questions and answers from anesthesia professionals. Current Anesthesia Drug Shortages – a curated list of drug shortages relevant to the anesthesia professional. Clinical Safety Tools – printable posters and visual aids, informative articles and Q&A regarding clinical safety. Helpful Links – a curated list of links to organizations and resources relevant to patient safety. APSF Video Library – educational safety videos created or sponsored by the APSF, freely available for viewing or download.